Darkness settles in. The soft colors of morning quickly dampen and shadows sharpen. As you look up, the sun transforms into a black hole, winter constellations appear, and the seldom-seen corona — that ghostly halo of light that wraps around the sun’s surface — becomes visible. The temperature plummets causing birds to grow quiet, farm animals to shuffle to their barns, and crickets to begin their nightly tune. You’re now in the shadow of the moon. “It is this incredible multi-sensory experience that absolutely no photograph can do justice,” says Tyler Nordgren, an astronomer at the University of Redlands. On August 21, 2017, that shadow will sweep across North America as millions revel in a total solar eclipse. It’s the first one to grace the continental United States since 1979 and the first to run from sea to shining sea since 1918. Although a total solar eclipse — when the new moon passes in front of the sun and blocks its bright disk — happens once every year or two somewhere in the world, it’s still a rare sight. Roughly 70 percent of Earth’s surface is covered in oceans, causing many to miss the land. Even then, the moon’s shadow might sweep across the isolated deserts of the Sahara, remote mountaintops in the Sierras, or the war zones in Syria. But this August, the shadow will glide across a strip (roughly 4,000 kilometers long and 120 kilometers wide) of solid and accessible ground. This roughly 120-kilometer wide strip (the so-called path of totality) will touch U.S. soil at 10:16 a.m. PST near Oregon’s Depoe Bay. It will then race across the state at about 2,700 kilometers per hour — a speed so fast it leaves the Beaver State only 10 minutes and 52 seconds after it first appears. It will continue at this clip, gliding through 12 states and three national parks, before its final stop in Cape Island, South Carolina at 2:49 p.m. EST, roughly 90 minutes after entering the U.S.
With so much land to cover, many anticipate that it will be the most widely shared event in human history. 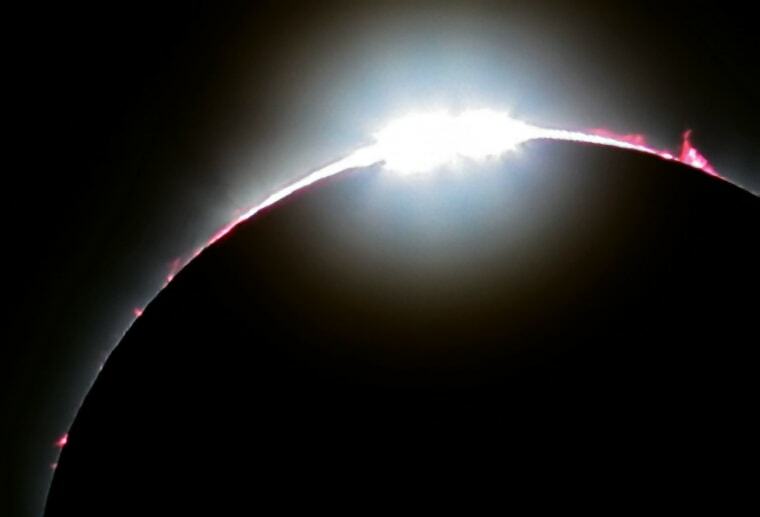 Although astronomers have been observing total solar eclipses for thousands of years, every one is different, says Jay Pasachoff, an astronomer at Williams College. He should know. Pasachoff has traveled across the world to see 65 solar eclipses over the course of 58 years (34 of which were total). Only last month, he visited Patagonia in southern Argentina to study an annular solar eclipse (where the moon doesn’t quite cover the sun’s disk and leaves a ring of fire). Last year he visited Réunion Island, a French island just off the coast of Madagascar in the Indian Ocean, and Ternate, a spice island in eastern Indonesia. The list continues long enough to make any eclipse enthusiast’s mouth water. But Pasachoff doesn’t travel the world for just another chance to see the multi-sensory spectacle. He’s on a quest to glimpse the seldom-seen solar corona, which harbors many of the sun’s remaining secrets — like space weather. It’s not uncommon for solar storms to pummel Earth. The sun can spit off several solar flares in a day, each one releasing 10 million times the energy of a typical volcanic eruption. And it can hurl coronal mass ejections — super-charged bubbles of plasma — into space at thousands of kilometers per second. Should one of these hit the Earth, it poses a threat to astronauts aboard the International Space Station and power grids below. “We're so dependent on our electricity now that a huge solar flare could cause major damage,” Pasachoff says. A better understanding of the intricate relationship between the sun’s magnetic field and its corona might help us take better precautions against space weather. So Pasachoff will head to Salem, Oregon this August to observe the sun’s corona for a few minutes — a stressful situation that allows little time to enjoy the eclipse. Still he’s appreciative of the time he does have to look skyward. A few decades ago, he would have spent the entirety of the eclipse staring down at his equipment, but thanks to automation he can spare a few seconds now. Meanwhile, 15 kilometers above Pasachoff’s head, Edward DeLuca, an astronomer at the Harvard-Smithsonian Center for Astrophysics, will be in a Gulfstream GV jet that’s been modified for atmospheric research. The plane’s innards have been torn apart and now include a telescope pointed toward a window on the right side of the cockpit that sits in front of several rows of computers. A team of four researchers, including DeLuca, will cruise into the eclipse path above Kentucky in order to image the corona in infrared light. Because our atmosphere’s water absorbs a lot of infrared light, this has to be done from a high-altitude observatory. As an added bonus, their speed will actually add a minute to the time they get to observe the event. Still, DeLuca and his colleagues will only have four minutes to track the sun. “It’s going to be a high-pressure situation,” DeLuca says. “You don’t want to be joysticking around the sun because there’s no time. You have to practice and be prepared to run a plan.” The team practiced their flight path in December and will continue to plan this summer. Although DeLuca and his colleagues will collect the longest observations during this eclipse, others are taking advantage of the fact that the shadow does touch down for 90 minutes. For the citizen CATE project, 60 identical telescopes will be set up such that as the shadow of the moon leaves one observer it falls on the next one to the east. This establishes a “relay race” of observations, allowing astronomers to study the corona for a full 90 minutes — well above the typical two or three minute bursts of darkness at any one spot. But the research doesn’t end with the sun’s corona. The National Eclipse Ballooning Project will send 72 balloons skyward in order to look down on Earth’s atmosphere. Jennifer Fowler, a staff member at the University of Montana who is a part of the project, is curious to see how our atmosphere responds to the sudden loss of sunlight. She suspects that clouds and gravity waves — similar to the ripples created when you drop a stone in a pond — will form in the wake of the eclipse. Some scientists think the latter are an indicator of the turbulence you might feel in an airplane, but the exact link is uncertain. Fowler is hopeful her work will help pin down the connection and help to inform the aviation industry. She’s also hopeful the research will have a direct impact on anyone who can’t make it to the path of totality. The team will live-stream a video as seen from the edge of space — something that has never been done. In the video, the shadow will appear as a black hole on Earth, erasing any readily seen features in North America and providing a sight that should fill viewers with a sense of wonder. Still, most researchers are hopeful that millions will see the event live — roughly 12 million people live within the path of totality, and another 40 million within a few hours’ drive. Not that Nordgren plans to share the event. The only equipment he will bring to eastern Oregon is a few lawn chairs and a few bottles of champagne to share with friends and family as they cherish the beauty. Given that totality lasts for only a few minutes, Nordgren thinks this is truly the best way to enjoy such a life-changing event. And without a camera, or a phone, this event is cost-free. That’s one of the things that Speck loves about the upcoming eclipse (although she recommends buying eclipse glasses for $1). Although scientists can’t be sure how many people will drive toward the path of totality, they expect — and are hoping for — millions. After all, hotels and lodges in national parks along the eclipse path have been booked for years.